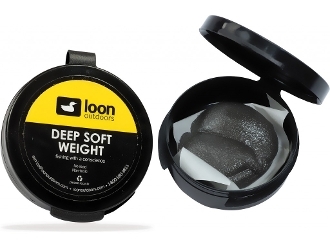 LOON OUTDOORS DEEP SOFT WEIGHT This charcoal-colored, non-toxic, Tungsten-based product is biodepradable and reusable, making it an environmentally friendly alternative to split shot and other lead-based weight. The weight and depth are easily adjustable to make sure that a nymph always finds the bottom. Can be used as a temporary bead head for nymphs. Pinch off the desired amount from the container. Apply to leader in the shape of a football at the desired location. Dip in water to harden. Remove or change the size when needed. Made in USA.